UTRN is an exciting ETF because it is different. This ETF takes advantage of the well-researched anomaly of short-term reversion. Investors who like large-cap stocks should seek some exposure to this ETF for diversification of strategy. One of the freshest funds to cross my desk in a very long while is the Vesper U.S. Large Cap Short-Term Reversal Strategy ETF (UTRN). I love the ticker as well. Cute. What does UTRN do that is so different than the rest? Why should you consider adding this to your portfolio? UTRN generates alpha by trading short-term reversals. The fund essentially buys big stocks that are making sharp short-term pullbacks. History bears out that stocks which fall the hardest over the past week have a small bounce-back effect the following week. As someone who consults and develops quantitative strategies for family offices as well as a large global asset firm, I can categorically tell you that short-term reversal is the single most powerful factor I have ever tested. And I don't believe that this anomaly is going away either because it is based on a behavioral bias. A sharply dropping stock creates panic. Then investors realize that the panic is overblown and prices temporarily go up. Fear and greed are the two best ingredients to build a strategy on. Why Is This ETF So Important For Your Portfolio? So why is this ETF so important? Beyond the return profile, why should you buy shares in UTRN? One word - diversification. No doubt you can even think of a few more. But the problem is that the S&P 500 ETF (SPY) already encompasses many of these methods. For example, SPY has decent coverage of the various sectors. 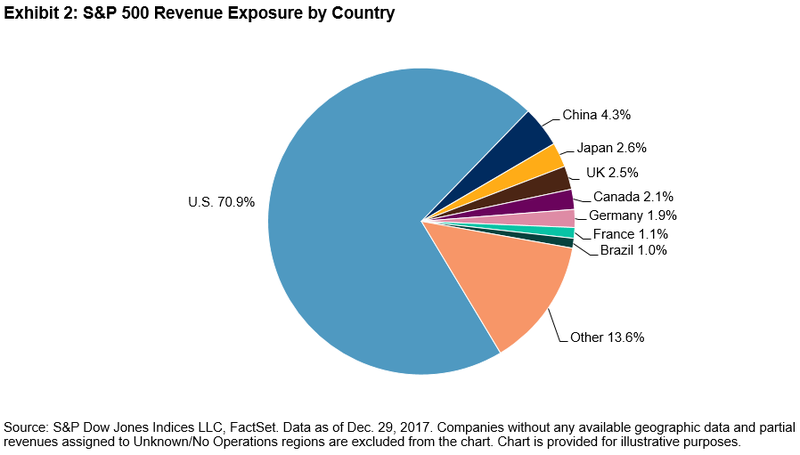 And the S&P 500 ETF has a good chunk of its revenue derived from non-US countries. The S&P 500 contains a mix of high-beta and low-beta stocks, growth, value and quality stocks. The problem is that all these above-mentioned forms of diversification are somewhat similar. Yes, they have some property, attribute or factor that is different. Yet the strategy is the same. You passively hold a large group of stocks. The longer the holding time, the more you are betting on the outcome of the company. You don't have a lot of diversification of strategy. I would love to see quant funds that get truly active with regards to various anomalies. Do something different for retail investors already! Show us a great micro-cap fund that isn't cap-weighted (which works against the size premium) and does more than just hold small stocks. Show us some strategy. Use those brains to build something that will wow us. But what do we get? A lot of funds that focus on some fairly non-dynamic factor such as volatility, value, sector or country. Over long periods of time, returns often fall to some long-term average. What about buying stocks based on a short-term property that is dynamic? Do something different. That's the source of real diversification - not just tweaking a fairly passive buy and hold strategy. UTRN marks a new type of fund that is doing something very different. This is a type of diversification that is sorely needed in equities - diversification of strategy. It is my recommendation that if you own shares of SPY, add some shares of UTRN. The one potential problem with this strategy is that portfolio turnover can be very high. Many people believe that once you account for trading costs, the strategy will not result in excess returns at all. A white paper posted in 2010 titled, Another Look at Trading Costs and Short-Term Reversal Profits, challenged that view. See the chart below which tests the short-term reversion strategy between 1990 and 2009. This is quite interesting. We find a couple of very interesting points. 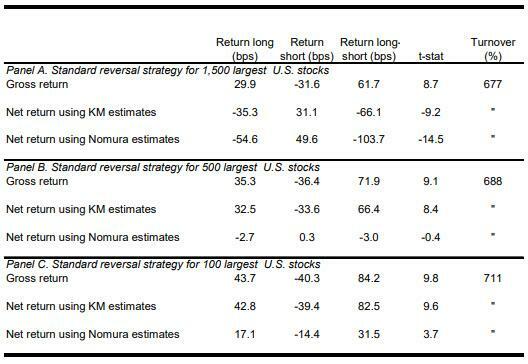 Short-term reversal returns are highest in larger stocks. The largest 100 stocks work the best (see Panel C). 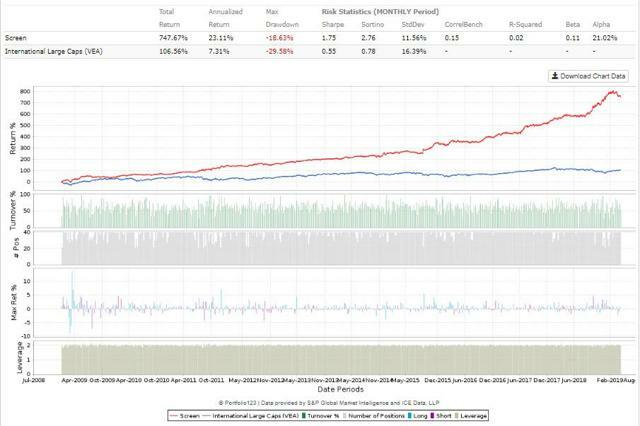 Gross weekly returns of this strategy are 0.437%, or 43.7 basis points. If we were to compound that weekly return, it would result in an annual return of 25%. But that is gross returns. Once the paper factors in trading costs, that number drops to about 9% annual returns on the long side. This hardly seems worth doing for a long-term annual return of only 9%. 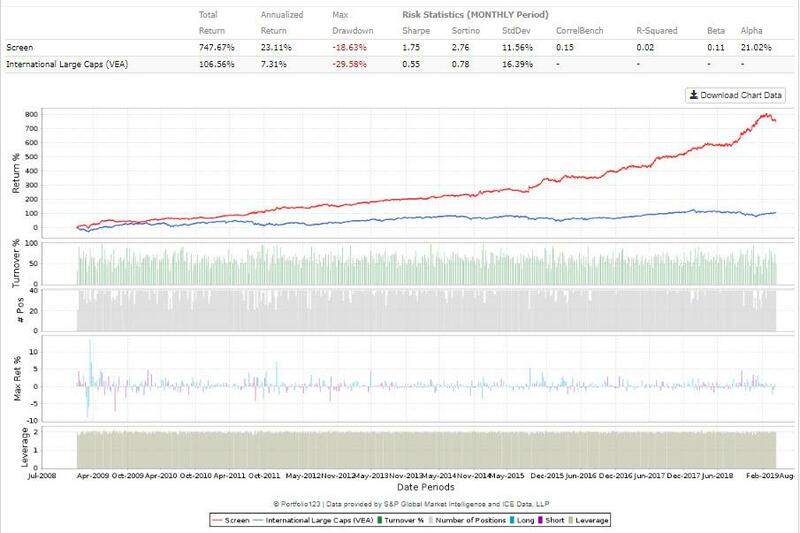 Keep in mind that I am only dealing with the long-side of the strategy since UTRN is a long-only fund. In the appendix of the paper in Table 5, you will see a modified version of the reversal strategy. Turnover is lowered by holding onto stocks until they rank in the bottom 50% of the universe. By lowering turnover in this way, they were able to increase annual returns to 16% by trading pullbacks in the largest 100 stocks between 1990 and 2009 after all trading costs. The point is that you do need someone smart behind the helm that is doing more than simply buying pullbacks. And this is where I talk about fees. I feel that there is way too much emphasis on fees. If you are buying some passive strategy with very little turnover, then by all means look for the lowest possible expense ratio. Higher fees will erode returns. But when you find something truly different that is being managed by professionals, you need to pay them a wage. Otherwise, people who know how to make returns just take it private. These people do exist. Don't believe me? Look up the Renaissance Technologies flagship fund, Medallion, which has a long-term net average of 40%. But forget about getting a piece of that action unless you basically build rocket ships in your spare time. An expense ratio of 0.75%? Compared to hedge funds - which is the closest comparison of this ETF that I can make - it is a bargain. You'd be hard-pressed to find someone willing to run such a high turnover strategy for less. So how exactly are the smart folks at Vesper taking advantage of the short-term reversal anomaly? What is the secret sauce? Well, the answer is that it is a secret. They trade based on something called a Chow Ratio which derives its name from Professor Victor Chow. What I can say is that the Chow Ratio is based on a well-known and widely studied phenomenon, short-term reversion to the mean. What needs to happen next is that investors need to take notice of this below-the-radar fund. Ask any quant and they will tell you the same thing, short-term reversion is an incredibly powerful source of returns. I am shocked that the net assets are only around $12 million. They should be closer to $100 million by now. Investors need to learn about this powerful anomaly and start investing in this fund. The second thing that should happen after AUM climbs is that Vesper should launch a market neutral version of the fund. According to the previously mentioned white paper, the weekly return between 1990 and 2009 of the market neutral strategy in the 100 biggest stocks was 53 basis points after costs. This was using the smarter version that lowered turnover. That is over 30% annual returns if you compound it. Pretty amazing for a market neutral strategy after costs. I have my own market-neutral version of the short-term reversion anomaly in super-liquid stocks, and my findings are that since 2009, the annual return has dropped. You can see the gross returns of the dollar neutral strategy below. I do have ways to lower turnover, but this is just a quick illustration of the returns since 2009. Still, there is a lot of alpha present in such a strategy, and I look forward to what comes next out of Vesper. For true diversification, investors need to look beyond sectors, size, country and style. They should look to funds that do something fundamentally different from the rest. The Vesper U.S. Large Cap Short-Term Reversal Strategy ETF is such a fund. 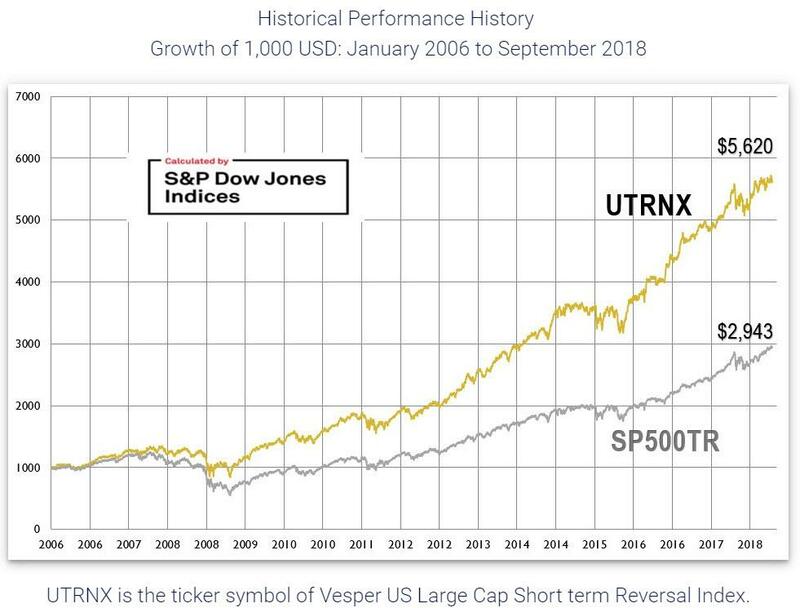 If you invest in large cap stocks and hold the S&P 500 ETF, I would encourage you to pick up some shares of UTRN. Beyond just being different, UTRN capitalizes on one of the most powerful anomalies that I have ever tested - short-term reversal. This anomaly has been researched for decades, and because it is rooted in a behavioral bias, I don't think it is going away anytime soon. I hope this ETF gains a lot of traction, and I am sure it will after a few years of showing out-performance. That holds out hope for a market-neutral or volatility managed version that is sorely needed. Most market neutral ETFs today have poor performance and Vesper holds the answer for a truly disrupting game-changer ETF in that category as well. Well done Vesper. May smart investment dollars start flowing your way.